Fuel types for high MPG low CO2 tax band eco cars. Today there are so many different vehicle fuel types available it is confusing what is being offered. We have taken the 6 most popular eco car fuel types and explain what they are and what it means to buy vehicle using these fuels. Uses hydrogen to produce electricity that is stored in batteries that are then used to power an electric motor. Pure electric vehicles that store energy in lithium-ion fuel cells and use electric motors to drive. Operate in the same way as Pure Electric cars, however they have a small petrol engine, that can be used to drive a small generator and charge the batteries if they are depleted. Operate using both petrol and electric motors, to drive the wheels. The electric motor is charged from the petrol engine and or the slowing down of the vehicle. 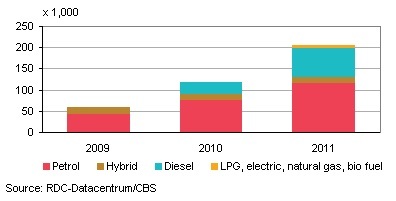 Traditional combustion engine vehicles refuel by filling the tank using petrol or diesel. A combustion engine, converted to utilise Liquid Petroleum Gas (LPG). These can be cheaper to run and LPG is cheaper to buy.